Last week David Holmgren, Su Dennett, Brenna Quinlan and I completed the third iteration of our annual four-day workshop on Advanced Permaculture Design Process. It was just the best experience and is always this incredible incubation medium in which making permaculture stronger makes huge leaps forward. The chance to share new ideas then to bash them out with David and the group (which was particularly amazing this year). I feel like I have about six months of new insights and reflections to process, many of which will in time find their way into this blog. Now I’m sorry I didn’t record the conversation afterward but it is always just fascinating and in the several times I have run this experiment I’ve noticed similar patterns and participant reflections. One pattern is that the element assembly team always get a design down much more quickly (then tweak it). One reason for this is that so many decisions have already been made in the shape, size and number of the elements where it seems only logical to chuck them on the basemap and start fiddling around with them. Another is the element-assemblers (all groups got to experience both approaches by the way) approach the task in with any number of different sequences to what they focus on, where the discussion aside from placing elements in sensible microclimates is around their relative location. One thing that is almost inevitable is that the discussion and focus jumps around as someone suggesting the placement of one thing sparks off an idea in someone else about some other thing and so it goes on. The partitioners, on the other hand, who rather than being given all the elements then being told “go for it!” are given one instruction at a time, which they must follow before moving on. This means they end up focusing on one high level partition first, then the next, and so on. Which means the sequence is the same for each group, and that they are all focusing on just one decision at a time (such as where is the line between the area under roof and the open area). In terms of participant’s reports on their relative experience, they tend to say that the partitioning approach flowed more smoothly and felt better and less random. That said, it can also be frustrating not to have the clarity of the predefined elements in front of you from the start. There is initially much less certainty about where you are heading, and where you’ll end up, where that uncertainty only decreases slowly and to a particular point as you go along (where in assembling you end up with something that feels clear and finished despite the arbitrariness of so many of the decisions – something I think we feel unconsciously if not consciously). From patterns to details and back again – it’s ping pong (table tennis) – not darts! Okay I’ll sign out for now with a few photos from the workshop (thanks for sharing Sonja). All the best and lots more is in the Making Permaculture Stronger pipeline, of that I can assure you. I currently have seven fully active design process facilitation projects on the go on properties ranging in size from 1/4 acre up to 110 acres. 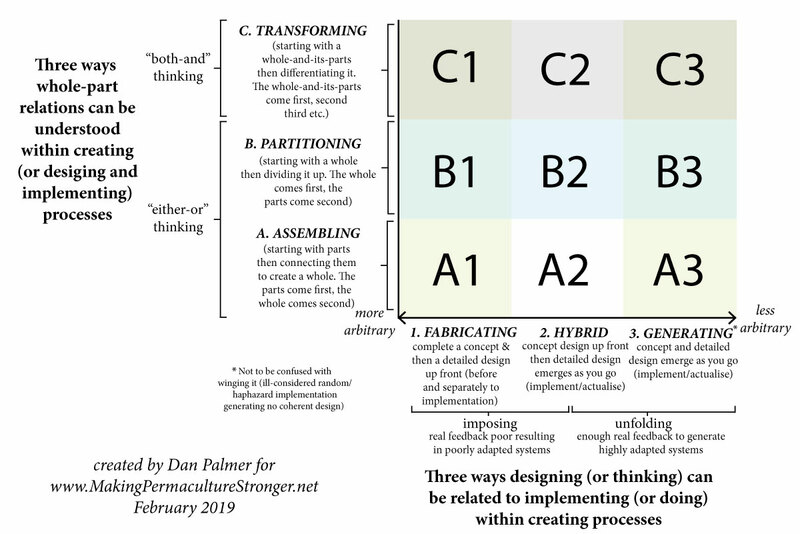 In terms of my process taxonomy diagram there are three C3, two C2, one C1, and one A1.